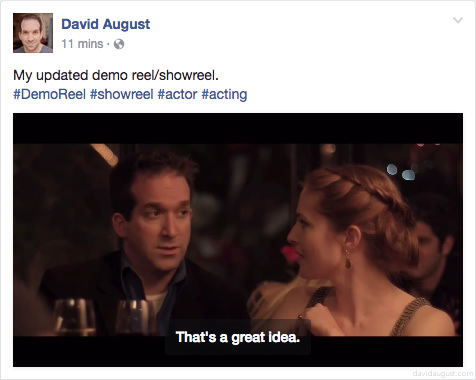 You should add captions your demo reel on YouTube and put your demo reel on Facebook in a good way. Uploading your demo reel video well is your last mile, your last step, of getting your work where it needs to be. If your demo reel (or showreel if you're from the British Commonwealth) is uploaded well, then it can to lead to good things for your career. Today I'll focus on YouTube's captions and uploading to Facebook. I can delve into other areas, like demo reel titles and descriptions another time. I can also cover other places, like casting sites, another time if you'd like. The next #DemoReelDay is September 13th, during episodic season. On #DemoReelDay, uploading your reel directly to Twitter will make it easier for industry to watch it, and for your reel to be a part of other features like moments. End sidenote. 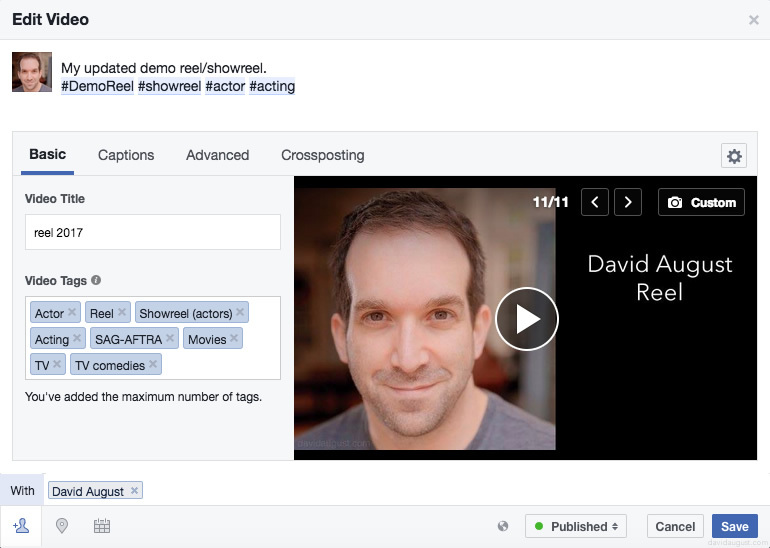 Today, I'll touch on YouTube captions and uploading your demo reel to your Facebook page. Correct and replace the automatically generated captions. I used their built-in tool for this. Watch your demo reel, with the captions on, to make sure they are right. We are helping search algorithms and people who can't hear the video understand it with captions inside the video. Download and save the .sbv file of your YouTube captions. This file will be useful for uploading elsewhere, like Facebook, and you don't want to lose all your work making them right. Upload the same video file you uploaded to YouTube. Fill out the fields on the basic tab, and add a custom thumbnail. I used the same thumbnail image file I used on YouTube. In the Captions tab, you'll need to upload your captions from step 3 above as a .srt file. Use a website that can covert your .sbv captions file into a .srt captions file. Facebook may complain about your .srt file unless it is named [filename].en_US.srt (I'm assuming your reel is in American English, if it isn't and you want guidance for yours, let me know). Don't need to do anything with the Advanced or Crossposting tabs. Watch your demo reel, with the captions on, to make sure everything is right. We are helping people and machines understand your video, and captions will display when people are scrolling through their Facebook feeds, making it immediately more intelligible. That should put your demo reel on Facebook in a pretty good way. Hope this helps and let me know if you've any questions in the comments, on Twitter, or something like that. Good luck!